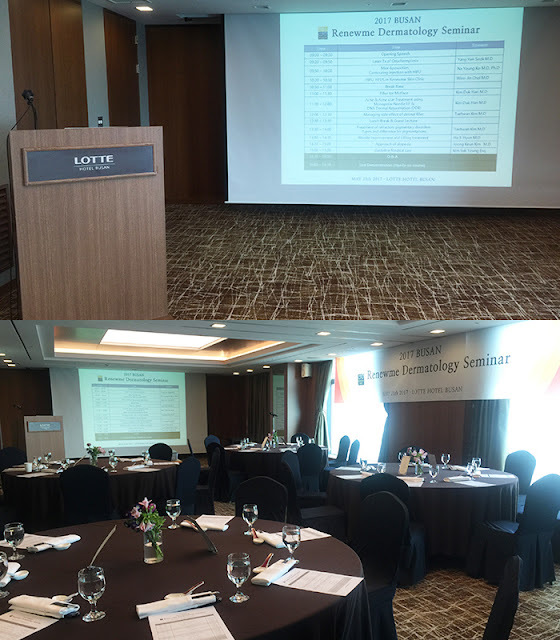 The seminar is started at 9am on May 21th at Lotte hotel, Busan. The hour of seminar is from 9am to 7pm with presentation and hands-on live course. 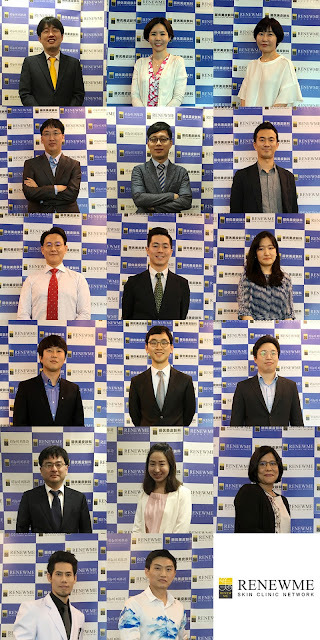 Before the seminar, our staff prepared the table and presentation and we really expected to have exciting seminar. 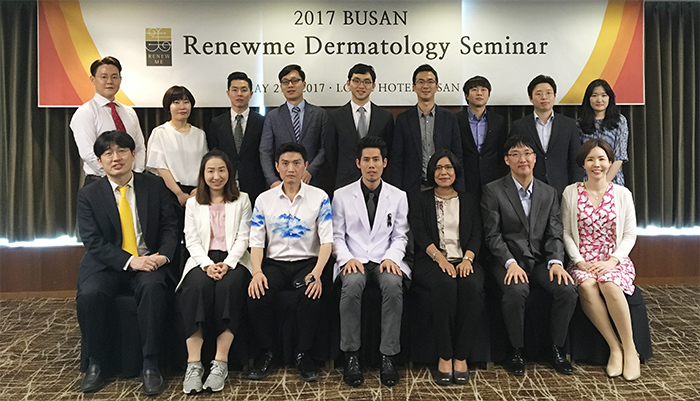 In the room, we made the start of the seminar and were ready to start 2017 Busan Dermatology seminar. 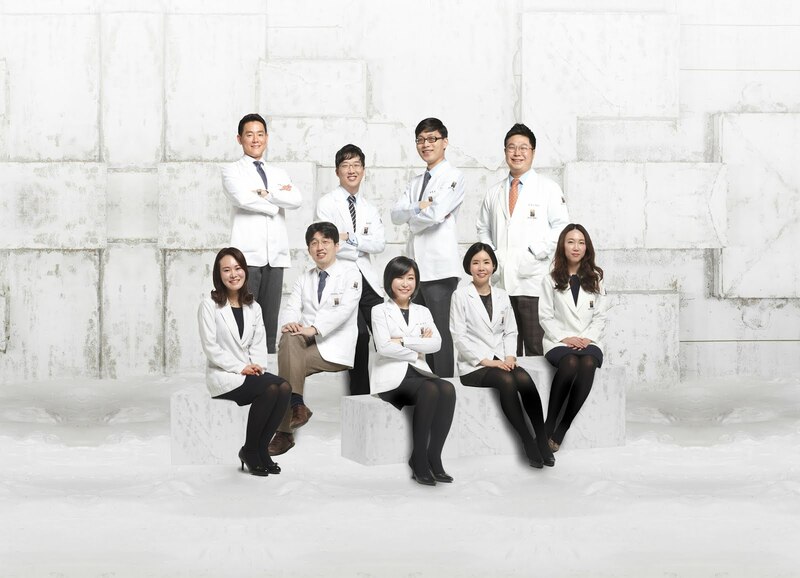 Also, the doctors from all 7 branches took the photo in front of photo wall outside. 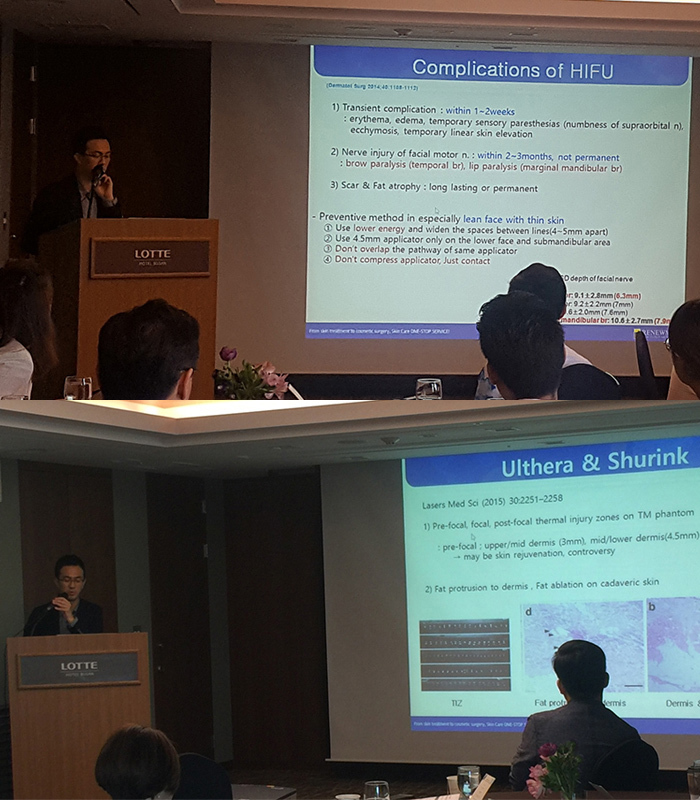 Also, the doctors from India and Thai were participated in the seminar. They were so excited about the seminar as well. After taking the photoshots, they moved to the room for opening speech. 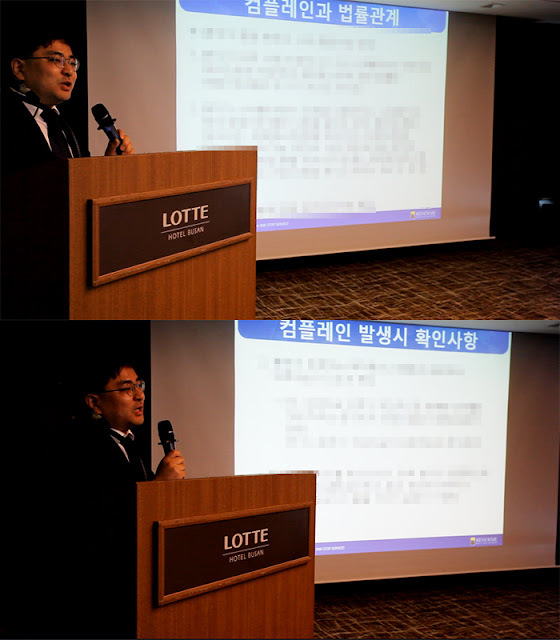 First, Dr. Yang Yoon suk started the seminar about opening speech with Korean Insurance systems. 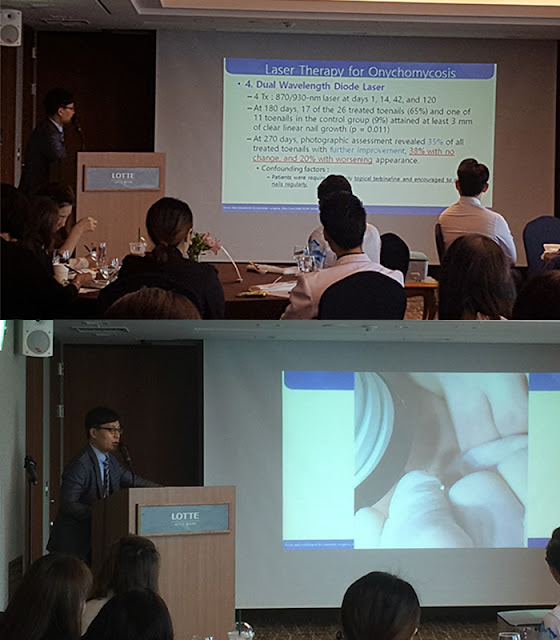 Dr. Yang talked about laser treatment for onychomycosis. He presented about how people treat Tinea pedis (Athlete’s foot) without oral medication. Renewme can treat patients by Pinpoint laser. So, patients who can’t afford to take oral medication and ointment come to our clinic for the laser called Pinpoint. He also explained about the real case of patients. 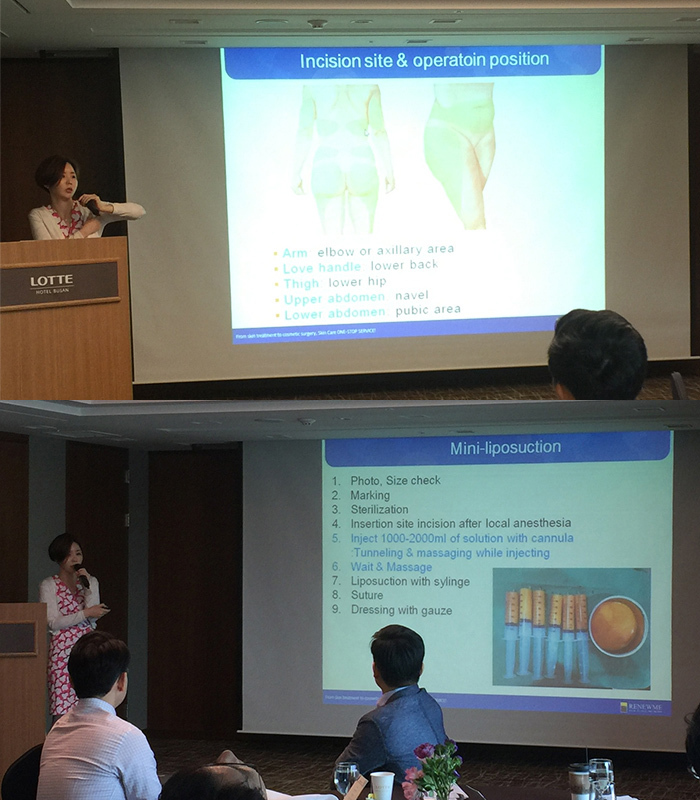 Dr. Ko presented about Mini-liposuction & Contouring injection + Shurink (HIFU). In the summer, most female are interested in fat out treatment. Dr. Ko is one of female doctors in our clinic had more experiences and tips for the liposuction. Our female doctor, Ko shared about her experience and explained the step of treatment. 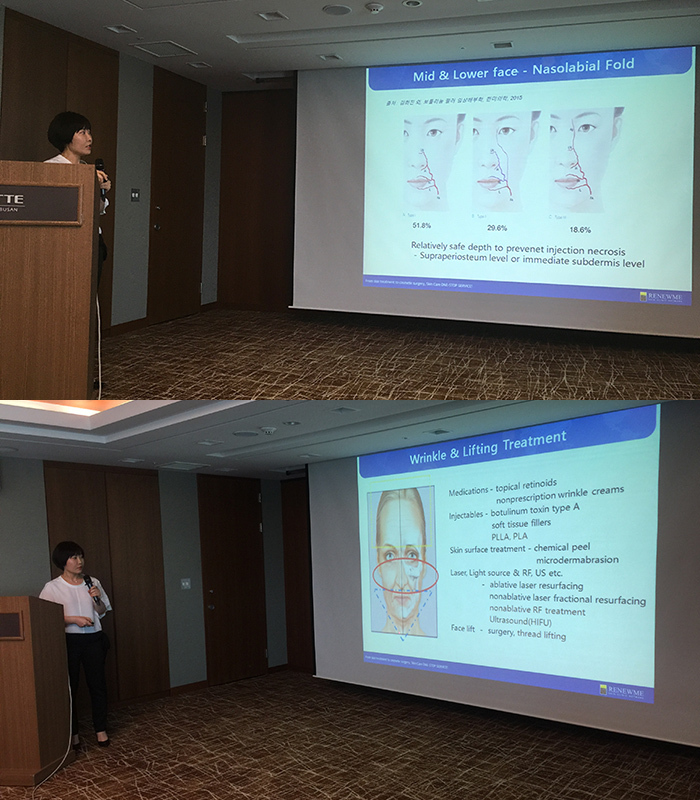 Dr. Choi had the topic of wrinkle lifting by using Shurink, LDM, and pigmentation. Shurink is a treatment for facial lifting that has less-painful and visiable effects for up to 6 months than other laser lifting. LDM is recommend for the patients who have sensitive skin types and it also helpful lifting with combination by other treatments. 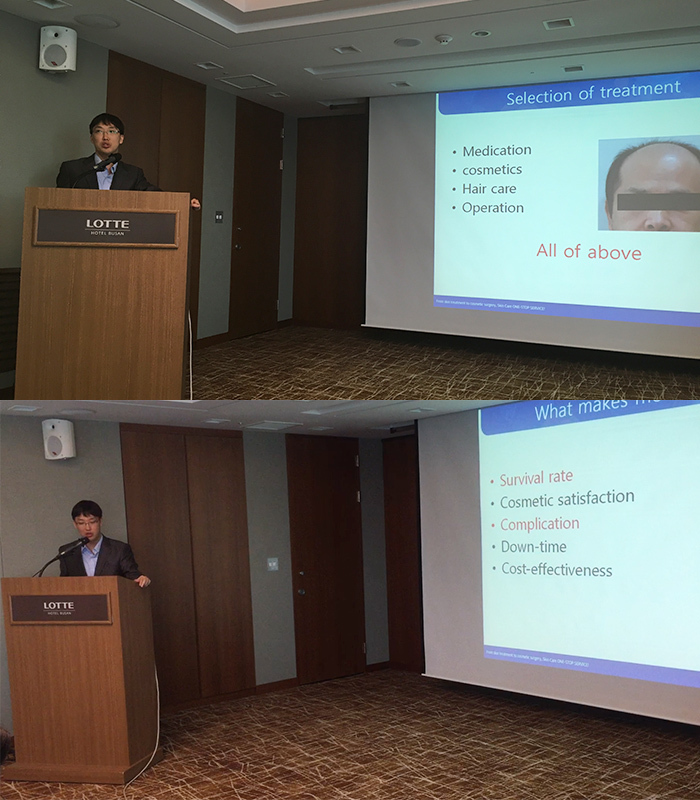 The topic from Dr. Kim was about the filler of midface for baby face. The filler helps the skin to bright improvement. The other topic was about radio-frequency needles and DNA self-corium for Acne & Acne scar treatment. DNA self-corium is a treatment for dermal layer to inject CO2 and H.A into the skin. If you want to have more information for detail, check our website below. 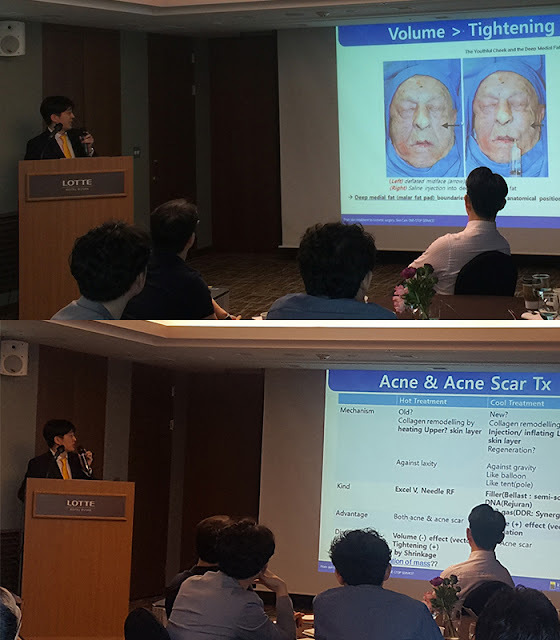 Dr. Kim presented about the side effect of filler with real-case and also birthmark by using Nd:Yang. Dermatology specialists can have many experiences of filler with safe filler products. We have regular seminar each year, so the doctor can do more safe than other clinic. Finally, we had Lunch time with Chinese’s food. The menu was shrimp with garlic, seafood and Chinese’s noodle and desert. 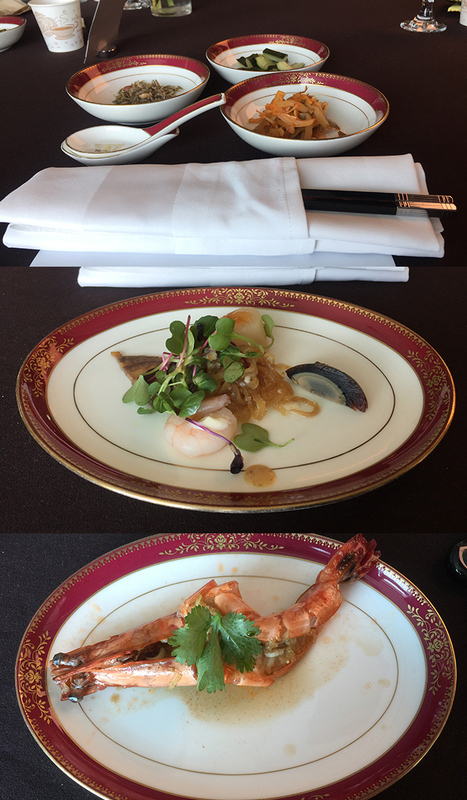 It was really delicious. With having a lunch, we got the break for an hour and talked together. Dr. HA presented about wrinkle improvement and lifting treatment and explained about types of thread lifting like PDO, PLLA Thread and HA filler. In our clinic, we do have treatment for filler, laser, thread lifting etc for ONE-ON-ONE consultation with patients. Some male and female have alopecia and they are worried about the alopecia. Our clinic keep searching the research from laser to Hair transplant. All branches have Hair transplant and many patients come to have a consultation for their agony. 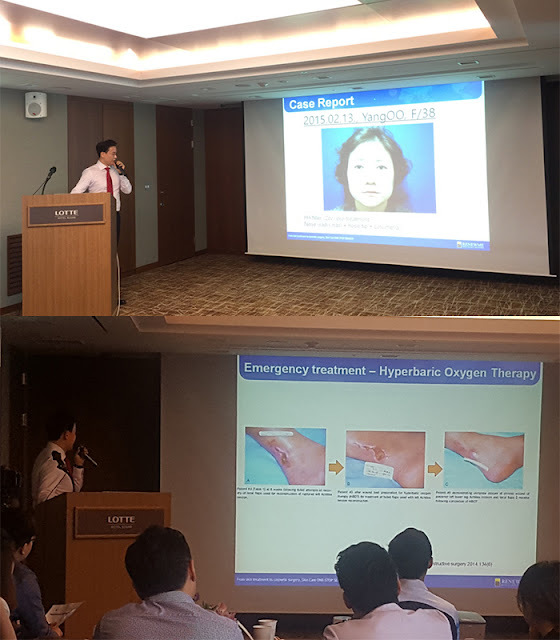 The lawyer Kim is presented about medical law with real case and how to deal with complain patients and how we do manage by the law. He also explained how the clinic can consent with the patients if they have problem and complain. After the presentation, we took pictures for all doctors and doctors from other countries like India and Thai. After the presentation, we moved to Renewme busan clinic and we prepared for the hands-on course. We looked forward to having a live demonstration in the clinic. I will talk about the next step for Live demonstration from next posting.